When politicians talk about the U.S. and Mexico, it’s usually in the context of immigration. But there’s another major issue facing these neighboring countries: illegal drugs, and the violence that all too often goes hand-in-hand with them. 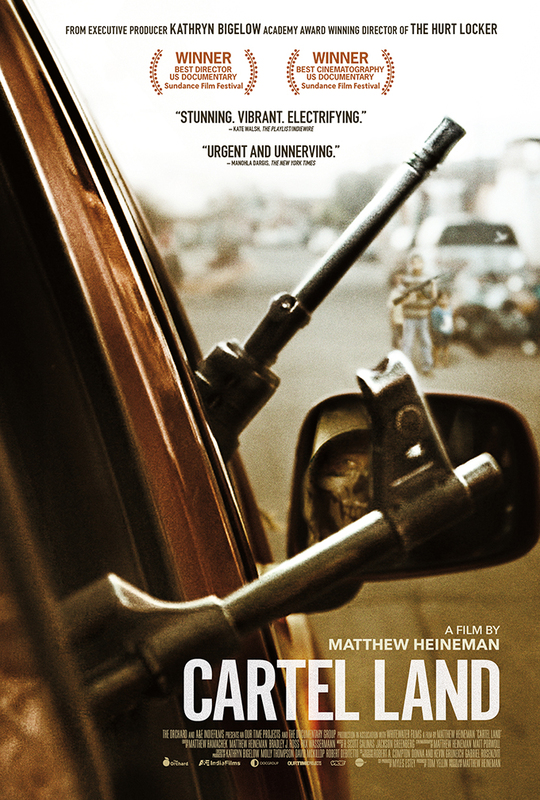 The new documentary CARTEL LAND explores this topic by focusing on two vigilante groups, one on each side of the border, trying to combat the cartels who are largely responsible for the drug trade. On the United States side, Tim "Nailer" Foley leads a group called the Arizona Border Recon. Although they are still to some degree concerned with stopping illegal immigration, Foley now sees drug trafficking as the major problem, and in his opinion the government authorities are doing little if anything to stop it. And so he works with whoever he can get to help him, even if sometimes their ideologies are more extreme than his. Foley comes across as sincere and well meaning, but there’s always the danger with vigilante groups, however well intentioned, going too far. For an example of this, we need look no further than the other side of the border, where Dr. José Mireles leads a loosely knit group known as the Autodefensas. Operating in the Mexican state of Michoacan, Mireles at first comes across as a kindly folk hero, and given the horrors average citizens have endured at the hands of drug gangs like the Knights Templar, it’s easy to understand his populist appeal. But as time goes one, the Autodefensas begin to act like thugs themselves, the Mexican government (who, it’s suggested, may be complicit with the cartels) seek to co-opt the movement, and Mireles turns out, like most heroes, to have his share of flaws. Although director Matthew Heineman does interview some of his subjects (including some masked cartel members), this is by and large not another “talking heads” social documentary. For the most part, he and his film crew are on the ground with the principals documenting the action as it happens. 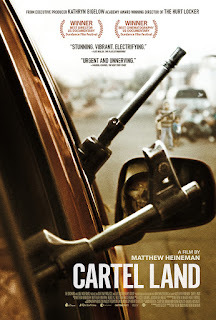 By letting events unfold rather than trying to shape a narrative out of interviews and film clips, CARTEL LAND largely avoids becoming the sort of slanted “call to action” that we see in so many modern documentaries. It may be sympathetic to the vigilante groups it covers, but it’s also ambivalent towards them. Nor does the film claim to offer any answers of its own in documenting this issue. At most, it’s saying that something needs to be done, and that the efforts to address the problem from both the Mexican and U.S. governments so far have been woefully insufficient. 3 ½ out of 4 stars.